Garden strimmers are used to keep the edges of the lawn tidier by reaching into those hard to reach places a lawn mower can’t get to. 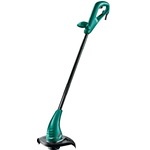 A garden strimmer also known as garden trimmers, weed eaters or weed whacker are also be used to cut longer grass and tackle weeds hence the names it’s also known as. 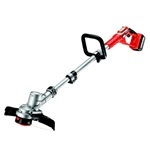 The best garden strimmer for you would depend on how big your lawn is. 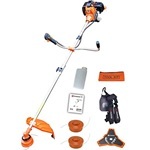 As they have different power outputs and battery life (if it’s a cordless model), the last problem you would want is for your strimmer to run out of power when you’re half way through trimming your lawn. 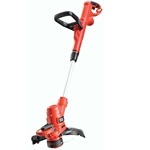 Also garden strimmers don’t take up much room and can easily fit into a shed or garden storage box. Before we start getting into detail on what features to consider when choosing the best garden strimmer, it’s important knowing the different types of strimmers so you can see what type suits you the most. Motor – You should pick the power required according to the size of your lawn. Bigger lawns may require more power otherwise it would take a lot more effort and it’ll also be very tiring. RPM – Refers to the cutting speed, the higher the number the faster it will cut. Unless you’ll need to use the weed eater for big jobs, you don’t need to choose a model with a fast cutting speed. 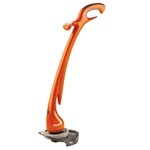 Height adjustable – Allows you to adjust the height to a level that’s comfortable for you. Furthermore, when it’s fully extended, it’s also used to reach areas that might be more difficult to reach. Cordless – Having a cordless strimmer allows you to move around freely without being limited to how far the cord will allow you to go. Cordless models would be ideal if you have a larger lawn where having a cord with an extension lead would get in the way. Run time – Cordless models would be powered by a rechargeable battery, the last thing you would want is for the battery to die when you are half way through when you are cutting your lawn edges. If you have a larger lawn then ensure you choose a garden strimmer where the battery will last long enough per charge for you to complete making your garden look tidy. Lawn mower attachment – Not really to be used as a substitute for a lawn mower, however it can be used for small mowing jobs or areas of grass on uneven ground. 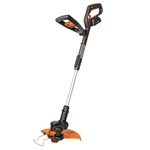 Weight – When you hold the weed eater for longer periods, the weight of it might start to tire you out, therefore if you will be using it for long periods then consider a lightweight garden strimmer. 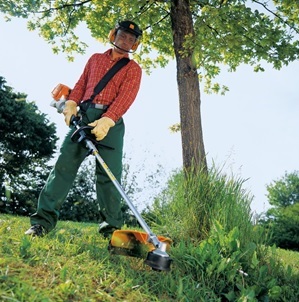 Unlike hedge cutters, most strimmers would cut with a line rather than a blade. For the ones that use a line, only the ends of the line will be visible when you look at the head of the strimmer. More line needs to be released as it wears out, when the line eventually runs out, it’ll need to be replaced. Automatic feed – This system feeds more line automatically when needed. Manual feed – This method involves having to stop the strimmer when more line is required and manually pulling out more line yourself. Bump feed – When you require more line you have to tap the head on the group to release more line. Just like lawn mowers, strimmers also come in 3 types. The type most suitable for you would really depend on the size and type of your lawn. Electric – These types are corded and powered through the mains. You don’t have to worry about the strimmer running out of power. Lightweight so easy to handle and carry. Limited to how far the cord length will reach. 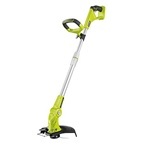 Cordless – Powered by a rechargeable battery pack which can be detached from the strimmer so it can be easily charged through the mains. 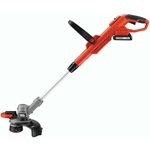 Freedom to use the strimmer at any location in the garden as it’s completely cordless. The battery life from one full charge only lasts for a certain amount of time, so you need to ensure you get the job done before the battery dies. 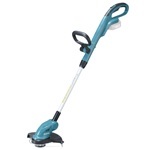 Petrol – Also cordless but more powerful than corded and cordless strimmers. 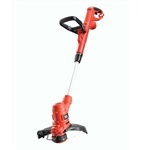 Makes the job easier as the motor is more powerful than corded and cordless models. Generally more expensive than corded and cordless models. A lot heavier and noisier than corded and cordless models so might be more difficult to handle.